Psychopathic Writings: Daria TV Show - Is She A Psychopath? Daria TV Show - Is She A Psychopath? I took a look at some Youtube videos from the series and I got a good idea about what kind of girl Daria is. She's not a psychopath, but she appears to have some tendencies that fit the definition of Schizoid Personality Disorder, although in her case it could be a " phase" since she's still in her teens and her personality hasn't fully developed yet. It means she might change depending on her experiences in life over the coming 5 to 10 or even 15 years. I will also mention that she seems to lack the day dreaming and strong attachment to fantasies that may have their origin from her own imagination or from sources outside (such as the drama of certain characters in a TV series, the lives of celebrities, or the romantic lives of characters in books or magazines). She is clearly highly intelligent which in itself tends to make a person feel that they are outside and looking in upon the lives of others, seeing things they can never discuss or investigate with those others because of the intelligence gap. A high IQ gives her a natural ability to see through the superficial, empty platitudes that people tend to spend so much time and energy on keeping up for the sake of appearance and being popular, etc. A psychopath would be much more likely to (ab)use this insight and become the most social, superficial and adept manipulative most popular girl at school, and she would control her surroundings to further her own ambitions as well as just for the sake of having control and see how far she could get people to do things that are against their beliefs and their moral core. This last aspect is particularly interesting to psychopaths because we lack a sop called 'natural moral core' ourselves. Personally I think there's reason to question about to which extent there is such a thing as a 'natural' (read: inherit) moral core in normal people or whether it is mostly a result of 'adoption' from the individuals surroundings through affectionate bonding and responsive empathy. But that's a different question and a different topic. I hope my response gave you some perspective on the question about whether Daria is psychopathic or not. I would suggest that you check out a few more definitions of the psychiatric term 'Schizoid Personality Disorder', it will help you see why I very tentatively have given her that label. Hi Zhawq, thank you for the reply and post. I still think Daria is a psychopath. I just think at the time the show was made and at the time in general late 90's early 00's psychopathy wasn't very well understood. However now psychopathy is more understood especially among psychopaths who gain self awareness and have access to the necessary information. The character Daria has pure perception of clarity, and surroundings and people around her, isn't indoctrinated into social norms. Claims she doesn't have a conscience, but since conscience isn't morality and in normal people conscience and morality go hand in hand, but with psychopaths their conscience is just a check or a personal thing. 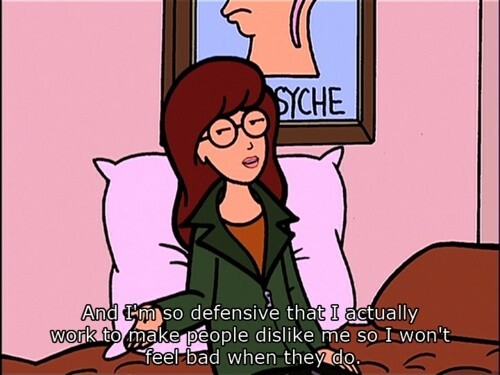 And also Daria is extremely intune with her self and thoughts at all times. She doesn't experience duality. Yes She is very smart but also an intelligent psychopath I think that's why she is able to see things so clearly and especially at her age as well. Also with schizoid's they tend to have an inner fantasy world but daria doesn't have that. And also I've noticed that some psychopaths especially who are unaware that they are psychopaths do tend to call them selves schizoid as well since psychopaths do daydream and sometimes have trouble concentrating. Hi zhawq also, Daria has had the same personality core since she was young to her teen period and also in some future flash forwards in the show she is pretty much the same core personality. Also Daria understands people very well and could easily manipulate and become the most popular but she doesn't care to. Her high intelligence definitley plays in a role in this but I think the psychopathy mixed with the high intelligence plays a bigger role. Yes Daria doesn't have any of the morality by society because she is psychopath and as jay says due to shallow and fleeting emotions doesn't internalise core social morals and norms into her conscience as part of her self. As I said before Psychopathy isn't very well understood by a lot of people and even other psychopaths (who are not self aware) and even self aware psychopaths. Only you Zhawq and Jay understand psychopathy better than anyone else in the world. If you watch the show Daria with self awareness as psychopath the character Daria definitley in my opinion is a psychopath, but again I may be wrong but I think you should give the show Daria a watch and see if you can see what I see. Also Zhawq another thing, When characters on the show die or suffer Daria isn't affected by it and also seems to more process those things intellectually rather than emotionally. And also when characters on the show suffer emotionally as well or have emotional problems Daria doesn't sympathise with them or seem to care. And also on the show there is a program called 'Sick Sad World' where they show disturbing content and violent stuff and Daria watches that show on tv all the time and is interested in it and it doesn't bother her at all. In fact in the show whenever someone dies or suffers or gory scenes or disturbing content whether it's friends of hers, family members or just people in general Daria is extremely nonchalant about it all the time. Just a few more things I thought I should add. Nice to see you back, Zhawq. As you assessed, Daria is not a psychopath. I think her flat affect might cause some to think otherwise, but As you suggest, it’s a stage. That’s actually part of the point of her character. She’s a brainy teenage girl who sees through the usual shallow teenage mentality, and finds it annoying. She’s cynical beyond her years, sublimating her feelings of teen angst with an aloof persona which lets her feel apart from her peer group on her own terms, rather than feeling unaccepted by the “in” crowd. Pure armchair psychoanalysis, to be sure, but I believe fairly accurate nonetheless. I remember my own teen years, and I have a daughter who was like Daria. Teens are a weird bunch. All kinds of personality quirks which they “grow out of”. Btw, Hope your health issues are under control. You may be right. After all, I based my analysis on the few episodes I watched on Youtube. If Daria showed the same emotionally distant pattern also when she was in her twenties like you seem to suggest that she did, she may indeed be a genetic psychopath who just developed a schizoid attitude towards like in general. This is not that uncommon. But based on her not having reached maturity with a fully developed personality surrounding her core character, I couldn't come to any other conclusion than I did. It would have been ideal if I had had access and time to watch the whole series, but I didn't and I don't. Yes, I must admit I still think she's an introvert highly intelligent teenager who's going through a phase that to some could seem like psychopathy. Furthermore, I don't believe she is meant to be seen as a real person, she's far too one-dimensional. And after all, she's a cartoon character in a show the purpose of which is to convey some trends in our culture which in itself makes it almost impossible to make a realistic psychological assessment. But it's in our nature to try and 'place each other on our societal shelves', it's how we make sense of what our roles are so it's forgivable that we try to do the same with people who aren't real - for as long as we remember that we can't draw lines between fictional characters and real people. Not that I think this was the intention of the other anon, I don't think it was. - I too wish my health issues were under control, but every time something gets dealt with something else pops up. Having read your work on and off for years, your health struggles have struck a chord. I am not a psychopath or b cluster personality type, so it will not surprise you to hear me say, Get well, live long and prosper. You have much more to live for and say. This is an excellent insight into a character from just viewing a few videos on youtube. You definitely do have a iq of 148. Interesting point about the natural moral core though a lot of that seems to be taught from the society people grow up in and what they are taught to believe, think and feel. As for the psychopath he seems to be immune to being taught morals.